”Change starst with… (you).” An absolutely appealing message mirrored in an interesting decorative in the SHS Library popularly known as the reflection wall. In pursuit for new library developments, seven staff members of the university’s library visited one of the renowned educational institutions in Metro Manila. The Josenian team composed of Whagie G. Saronillo, Nerissa C. Umbay, Theresa S. Rayla, Maribel F. Famador, Perla M. Tagsip, Edmondo A. Navarro and Engr. Ronilo L. Cempron visited San Beda College-Alabang (SBCA) last June 14. They are looking for ideas to benchmark on in the hopes to expand the USJ-R library services, collection, facilities and equipment. 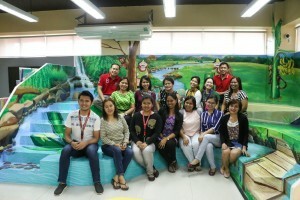 The team visited four (4) libraries located in SBCA’s new building namely the Grade School Library, the Senior High School Library, the Law Library and the Graduate School Library. The SBCA Graduate School Library offers an inviting area for reading and research fully equipped with sensor-activated discussion rooms and individual nooks for private reading. The main agendum of the library visit is to comply with the benchmarking recommendation of the Philippine Accrediting Association of Schools, Colleges and Universities (PAASCU) to improve the Grade School Library. The Grade School Library of SBCA showcases creatively and vibrantly designed fixtures and distinct services. One of the interesting fixtures in the library is the gamified platform – a square-patterned cushion with letters and numbers on it that allow students to read and play using manipulatives. The solar system modeled-ceiling of the library is something that can’t be missed with the planets on their distinct physical make-up with the fairy tale-like and nature inspired reading and storytelling areas in the library being highlighted. This nature-themed storytelling area at the Grade School Library is a favorite spot for grade school library users. It also emphasizes on maximizing the library space by using multipurpose furniture like that of storage compartments found under the chairs and tables that can be converted to chairs. The library also gives emphasis to distinct services offered to the grade school students like the regular game board, storytelling sessions, library instructions and bibliotherapy. Bibliotherapy sessions are conducted by librarians to students who receive disciplinary sanctions due to violation of school policies. After the session, the students will be made to answer an insight questionnaire. The next stop is the Law Library highlighting its tall-mirrored shelves, individualized cubicles for reading privacy and its specialized discussion rooms for law students and reviewees known as the “Collaborative Learning Hub”. 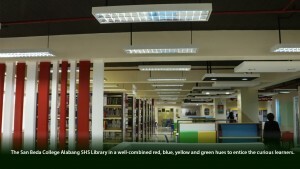 The team members also expressed that they were in awe upon entering the Senior High School (SHS) Library as vibrant colors of unique fixtures greeted them. The library takes pride on its exceptionally designed bookshelves resembling that of a leaf, its BEDA inspired and assembled reading corner, the automated collapsible discussion rooms and the makerspace. The animated ambiance and high-quality facilities of the SHS Library also caught the interest of the team. A part of the session assesses the student’s behavior in which specific reading materials were given for required reading based on the assessment. Moreover, SBCA also has a cafe adjacent to its Graduate School Library. The SOL Cafe highlights its well-decorated and ventilated area that provides a relaxing space for law students and reviewees as coffee and snacks are being served. Indeed, the library combined aesthetics, ergonomics and education/instruction principles in building its space, collection and services. The USJR Library Staff with the full support of the Chief Librarian – Mrs. Ligoria B. Pingul, had just completed the benchmarking activity with concrete ideas and plans to improve the Grade School Library in time for the 7th PAASCU Resurvey in 2021.